Your child or young person with disabilities may need specialist equipment for daily living activities – such as bathing, toileting, seating, sleeping and moving. The OT will visit you and your child at home to fully understand your situation. And can then suggest and discuss with you specific equipment and /or changes in routine which may help you. 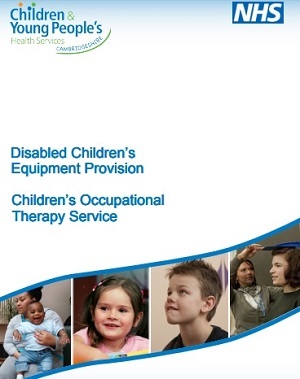 The OT may arrange for your child to try equipment and in some circumstances may arrange for an equipment supply company representative to visit you and your child. The service provides technological devices to support people and their carers with the challenges to everyday living and help with their independence. The team also offers ‘Telehealth monitoring’ for chronic long-term conditions. This means that they can monitor patients’ vital signs from afar. Anyone who needs advice on equipment for everyday living can contact the team on 01480 378160. The team take referrals from anyone, for anyone, for all ages and all diagnosis. There is a simple referral form that can be completed and returned to the team. An ‘assessment of needs’ is carried out; the equipment is then sourced and supplied. Free information and advice about daily living aids for adults and children. There are options for parents to get free information about daily living aids for children and young adults by e-mail, telephone, at events or by using a website questionnaire. You can also book a private Occupational Therapist home visit and get a list of local retailers where you can see and try products. Fledglings now has an online shop, with hundreds of products, including non-foaming unflavoured toothpaste and coiled self-tying shoelaces.